Universal Display is going to present a number of advances in their phosphorescent OLED technologies and materials at the 2010 Society for Information Display (SID) exhibition. They will also show new prototypes and product concepts. A major highlight will be a new light-blue UniversalPHOLED emitter system. The company has used this system to demonstrate significant performance gains in a commercial-sized white OLED lighting panel that can begin to address initial white lighting applications. 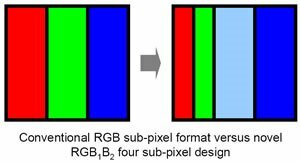 It also plays a key role in the company’s demonstration of a new four sub-pixel display design with the potential to accelerate commercial introduction of all-phosphorescent AMOLEDs with enhanced energy efficiency and extended lifetime. Update: UDC has published the technical specification of this new light-blue.